First and most obvious what you are getting is fresher and comes to you from a much shorter distance. This makes it possible to have tomatoes right off the vine, strawberries ripe from the field, etc. Those items are normally picked green and then shipped to ripen as they travel. And anyone knows who has had a fresh ripe tomato or strawberry, versus ones that were shipped over great distances while still green, that there is just no comparison! Fresher also means more nutrients because they haven’t been around longer and started degrading and they also haven’t had to be waxed or otherwise preserved to last longer. Fresh, unmodified and healthier is always a plus! Second, and as I mentioned above, your food isn’t being shipped over great distances, making the carbon footprint much smaller! If you grow it yourself you’re just walking out your own back door! That’s about as local as you can possibly get. If you are part of a local CSA or attend a local Farmer’s Market the items are coming from your local area, instead of being driven, flown or shipped by boat over great distances, hundreds, maybe thousands of miles, and sometimes from other countries! This makes your eating much greener over all and saves a whole lot of pollution from being added to environment. It also helps put money back in your local economy and we all know how important that is these days. Third (and I have to admit this might be my favorite) you know where your food has come from. You get to meet even the farmer in many cases! A lot of farm have festivals and things that invite you come see what they do and where. For instance I get my milk from South Mountain Creamery. I’ve been over the farm to their festivals and I’ve even met some of the family! Also with our CSA Farmer Rick has an e-mail address and has always answered promptly whenever I’ve had a question. The farm even puts out a weekly newsletter keeping you up to date with what is going on with the crops and how they are faring. I’ve even met Farmer Rick briefly as well too! It’s nice to see where your food is coming from and have a connection to the people who bring that to you. As I just mentioned we joined our CSA this summer (my sister is a member of a CSA too) and on top of what I’m planting myself since I knew we weren’t having a big garden this year, I wanted to be able to have locally grown, organic produce to enjoy all summer long. I’ve been keeping track of our CSA packages and have been very pleased so far! Jamison picks up our share on his way home from work and it makes Monday a lot of fun because I can’t wait to see what surprise I am going to get once he arrives! Farmer Rick normally gives an idea of what is going to be in the “box” each week, but that newsletter usually comes out after we’ve gotten our share. I like the surprise! It’s also a good way to try new things. I have wanted to try garlic scapes for years, but never could find them anywhere. We got some a couple of weeks ago and I loved them! It’s fun to try new things and it’s a good experience for Alexis to see new things as well! So now what? Want to find a CSA in your area (though in reality you’ve probably missed the boat for this year on that avenue) you can go to Local Harvest and use their CSA finder. Local Harvest also has a tool to help you find Farmer’s Markets in your area. It’s not hard to find these local avenues and you’ll be so happy you did! Now I’m going to share with you a recipe with ingredients from my CSA! 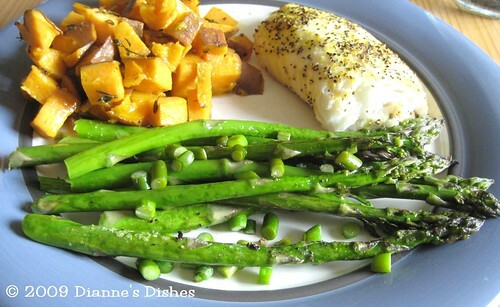 This is for those asparagus lovers (like me!) out there. 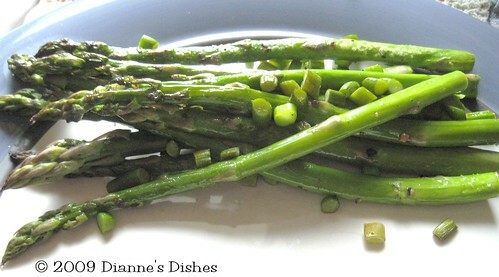 By pairing the asparagus with the garlic scapes you take a “normal” dish and make it that much better! It’s also healthy, so what’s not to like about that? Wash and trim the end of the asparagus. 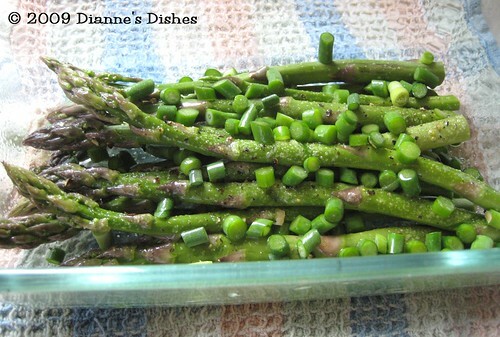 Place in a glass dish and sprinkle with garlic scapes, olive oil, sea salt and black pepper. Ok now here’s the fun part…you can cook this several different ways! You can cook this in a preheated 400 F oven for 25-30 minutes until tender (or in the toaster oven which I like to do when it’s hot outside so as not to heat up the house!) or you can pan “fry” it over medium heat until tender or you can place in a foil packet or grill pan and grill for 10-15 minutes until tender. How’s that for versatile? Notes: If you can’t find garlic scapes then you could use chopped garlic or onions instead. Personally I’m a fan of both locations attempts to move into the bio-fuels arena to decrease their footprints as businesses even more. You never hear about serious efforts by corporate farmers to do anything like that. I looked into buying from a CSA group when I lived in Philly, and found it insanely expensive (as in, I’d do better buying from Whole Paycheck–er, Whole Foods). Here, I just buy from the farmer’s market, whatever’s cheap and in season. I thought of joining our local CSA here, but it seemed like I’d still end up buying all the produce I normally eat from the grocery store. They had greens covered, but not much else. It’s in Idaho, so perhaps the local climate limits what they can grow. Oddly, I don’t think potatoes are in their repertoire. I plan to eat some local food tonight. Doesn’t get much better than squash from my porch. One of our local radio programs did an entire segment on this very topic today. Here’s a link for The Kojo Nnamdi Show from today. I found the whole two for one food stamps option for organic local food to be an interesting idea.